And now for something completely different, a modernist lamp at Portal del Angel, a very important street in Barcelona, near Plaza de Catalunya. Perfectly preserved, the lamp can be admired from a close distance since it is almost at street level. Other elaborate art nouveau lamps were shown here in the past: Art Nouveau Lamps. beautiful! and am i glad i am not the one to keep the intricate metal work clean! C'est peut-être un lampadaire à gaz, vu qu'il orne la porte de l'ancienne compagnie de gaz catalane, tel que le rappelle les initiales entrelacées qui le décore ? An exquisite shot of a gorgeous lamp. I cannot believe how much I feel all the various textures in this photo. What a treat! Happy New Year to you and your family, Carlos! Fotos lindas e perfeitas como sempre Carlos! Tenho um guia de Lisboa em PDF que posso enviar por mail. ...thank you for the good time I've had on your blog.... for all the beauty and the interesting stories. I hope you'll be back in the new year Carlos, I would rather miss your pics if you weren't! 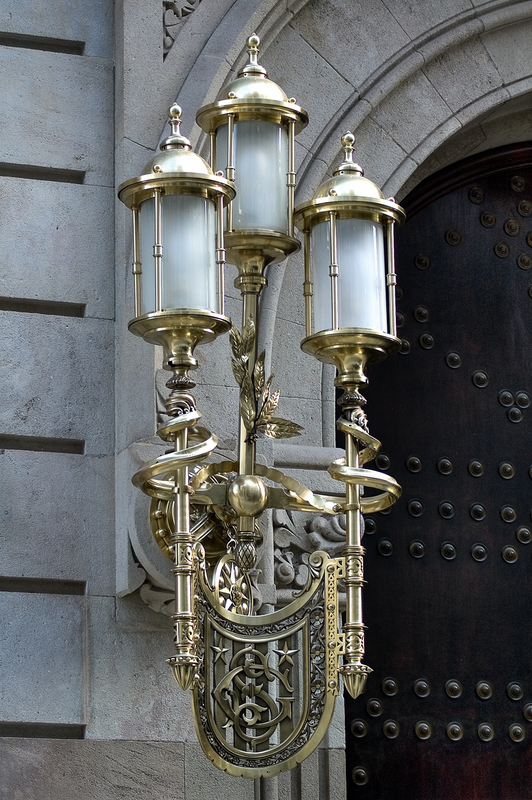 What a gorgeous lamp, you are lucky to have such a rich history in your city. Happy new Year! First of all I would like to say I needed some rest. Many have seen me perhaps on twitter or social median. That's is not so consuming as taking a picture and writing a post. But I will keep up the blog. Happy New Year. -LOL Deborah, cleaning that up must be tough. -Happy New Year Lydia and family. Thanks for your kind comment. -Happy New Year Claire. I love your photos.